Thomas Buttersworth was a marine painter. He was an English Seaman during the period of Napoleonic wars. During his lifetime, his work was not exhibited much. He born on 5 May 1768 and died in 1842. James Edward Buttersworth was his son and he was also a maritime painter. In 1795, he enlisted in the Royal Navy in London. At the time of war with the country of France, he served on HMS Caroline. It was before 1800, when he was invalided from Menorca. You will find 27 watercolors of Thomas Buttersworth in the National Maritime Museum of London. Many of the watercolors were mounted on sheets specifically from 18th century which was printed on muster and signal books. Further, he also painted many naval battles scenes as well as pictures. Among these ‘’Inshore Squadron off Cadiz” was the famous one. It was the scene which he witnessed. East India Company appointed him as the Marine Painter. 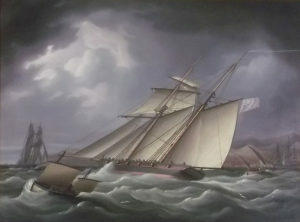 On commission, he also painted ship portraits. He started painting while he was on the sea only. His paintings were subjected to 18th-century Mediterranean subjects. His paintings of the Blockade of Cadiz and the Battle of St. Vincent indicated that these paintings are painted on the location only. 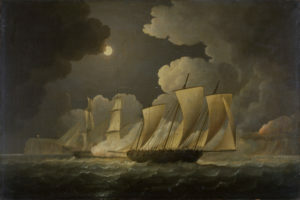 When he returned back to England, was tool painting as his career and known as the painter of marine scenes which executed the ship portraits of merchant vessels and larger naval vessels. The famous Battle of Trafalgar was among one of his paintings. In 1825, it was exhibited at the British Institution.